Steel vs brick fence – comparison chart. Which fencing material is better? Can be made any imaginable style and design. After installation steel fence can be painted in any desired color. Bricks are manufactured in wide range of colors and shapes. Fence can be custom designed on-site. No restriction to installation around any property. Good choice as a privacy fence for residential properties. Steel is a great material for building security fences. Brick fences have high level of security. Depends on fence design. Most steel fences are not for privacy. 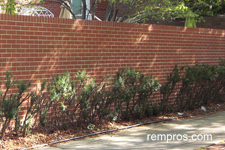 Solid brick walls are great privacy fence option. Steel is insusceptible to open fires. Brick is extremely fire resistant material. Brick fences have high resistance to impacts. Cannot be damaged by termites of insects. Steel is one of the most durable fencing materials. 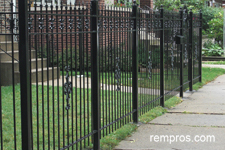 With adequate maintenance steel fence can easily last over 100 years. Proper built brick fence normally last 100+ years. Low maintenance fencing material, but steel should be painted with anticorrosion paint. Normally does not require much of a care besides regular cleaning. Less expensive compare to brick. Building brick fence is a costly project. Welding custom steel fence on-site require skills and experience and normally it is not a do it yourself project. Installation of prefabricated steel panels is moderate complexity task and could be done by handy homeowners with basic construction skills. Installation of brick fence is a difficult task. Installation of 10 steel posts and 9 factory made steel sections typically is a couple days project for a crew of three. Welding 90 feet of custom steel fence on site can take 5 – 7 days. Building 50 – 60 feet of simple 6 feet high brick wall is 4 – 6 days project for an experienced crew. Depends on damage, but steel fence is normally easy to repair. It could be a challenging task to repair badly damaged brick fence. 1 Rating was estimated on the scale from 1 to 5, accounting 1 as lowest and 5 as the highest quality of a product. Always consider the fact: not all products made equally the same and performance of particular fence significantly depends on individual product quality, adequate installation, and proper maintenance. Steel and brick are both great materials for building residential or even commercial fences. Steel fence is normally cheaper to install. Both fences are very durable with high life expectancy. Which one to install will mainly depend on homeowner’s preferences.